specific sanctions are in place against a country by clicking on the continent and then on the country. This information is updated regularly by www.SanctionsAlert.com. SanctionsAlert.com Interactive Sanctions Map is a member-only benefit. SanctionsAlert.com members have access to a wide variety of exclusive resources they can use to enhance sanctions compliance in their organizations. From training webinars to quizzes, enforcement actions database to official guidance and sanctions essentials guides, SanctionsAlert.com members always get more. Disclaimer: This interactive map is a service made available by SanctionsAlert.com. 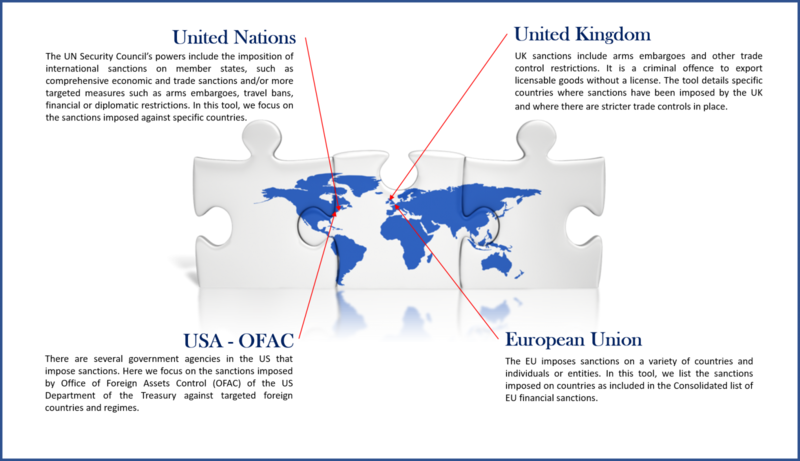 It provides general information related to EU, US (OFAC) and UN sanctions against countries. This website is only one source of information among the many sources that are available to you. You may wish to consider multiple sources in order to make an informed business decision. This website does not provide legal advice and www. SanctionsAlert.com is not a law firm. Although we go to great lengths to make sure our information is accurate and useful, we recommend you consult a lawyer if you want legal advice.